After half a decade playing the London toilet circuit and constantly sending out demos, My Drug Hell finally found a record deal with the US based independent Shimmydisc, on the condition they paid for recordings. By a twist of fate singer Tim Briffa’s grandmother had died the week before, leaving him £2500; and so the band promptly booked a week in a vintage eight track studio in the East End of London. The album was around half complete when Shimmydisc went bust. Tim started shopping around the half-finished album to scant response, when he happened to strike up a conversation with a fellow customer in the Music and Video Exchange in Notting Hill who mentioned he was setting up a record label. Tim went back to his studio, played him the tape and was offered a deal on the spot. 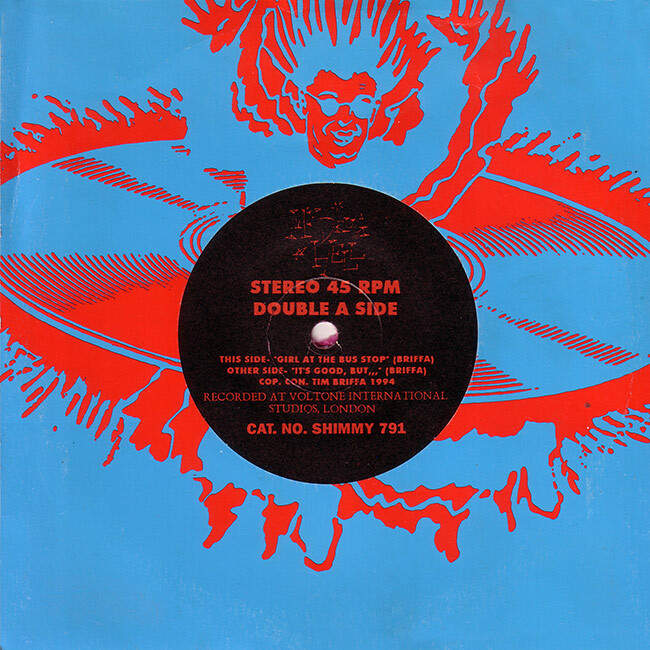 ‘Diversity Recordings released two 7″ only singles from the material so far recorded. 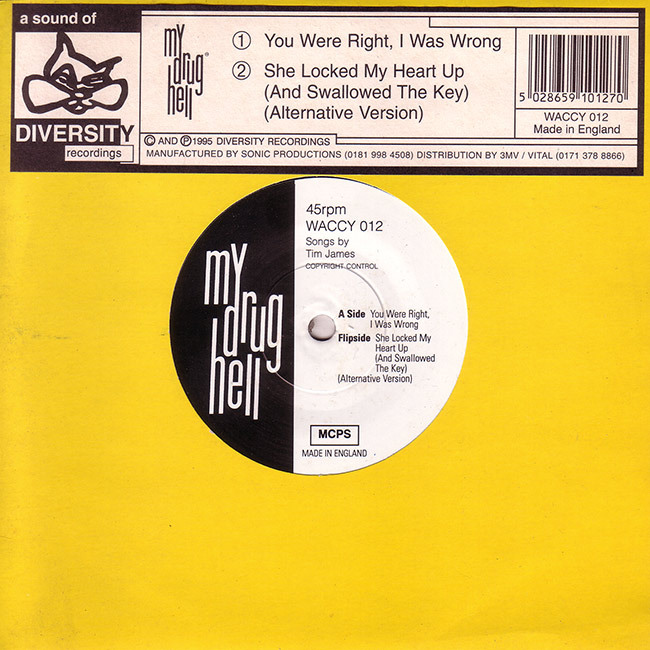 “You Were Right, I Was Wrong” went into the Indie charts at No 5, while “Girl At The Bus Stop” was awarded Single Of The Week on Radio One’s Evening Session and spent twelve weeks in and out of the Independent Top 30. It may well have done better had a flood at the pressing plant ensured that the record wouldn’t be available until two months after the Evening Session had stopped playing it. Joe eventually rejoined, but problems continued to surround the band and the album they were (still) trying to finish. 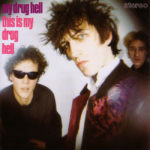 Half the completed master mixes had already been ruined by a faulty tape machine, the front cover artwork had been lost by a magazine doing a feature on the group and Joe quit the band and returned twice more. Finally though, he left again, but this time there was no turning back, and he was replaced by Brighton sticksman Raife Burchell. The live shows and demeanour of the band improved dramatically. Eventually, the album just needed one more track for completion. Owing to various technical hitches, “Jinx’s Hole” had been re-recorded three times in three different studios. Just as a finished version was at last recorded and ready to be mixed, a sound engineer pressed the wrong button and erased the vocal track. The studio was booked solid for the next three months and by the time it became free and the track could be completed, problems were beginning to emerge at the record label. Two weeks before the scheduled release date, Diversity Recordings ceased trading. 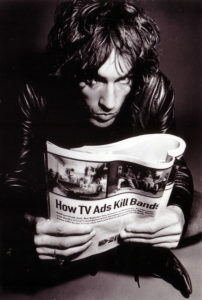 Although originally recorded on a four track on a second hand roll of tape the song was voted Single Of The Week on several stations around the UK including Steve Taylor’s show on XFM and Mark Goodier’s weekend show on Radio One. It was also adopted as part of a six month TV ad campaign for Miller Genuine Draft beer in the US and UK, and has been used in two US feature films (Black Circle Boys and Origin Of The Species). 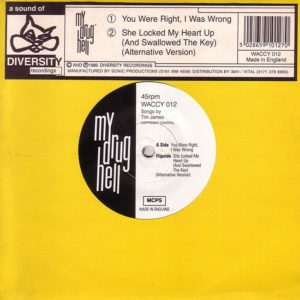 Two more singles were released from the album, (2am and Maybe We Could Fly) after which Paul Donnelly left to be replaced by Sebastien Hoog. This second line-up gigged regularly but disbanded without releasing any recordings. 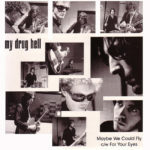 In 2010 a third line-up featuring David Preston on bass and Sebastian Kelling on drums finally released their follow-up My Drug Hell 2 and a single Mysteries Of Love which was used in the Brit gangster film The Crew along with two other tracks from the album (You Don’t Need Me Today and Nowhere Town.) A third album The Good Times Are All Gone was finished last year and a vinyl release is currently being planned. After a short hiatus, MDH are now back with Harry Stam (also of The Pacers) on bass, and Tony Coote (also Cat Black, PP Arnold) on drums. Gig dates are to be announced shortly.